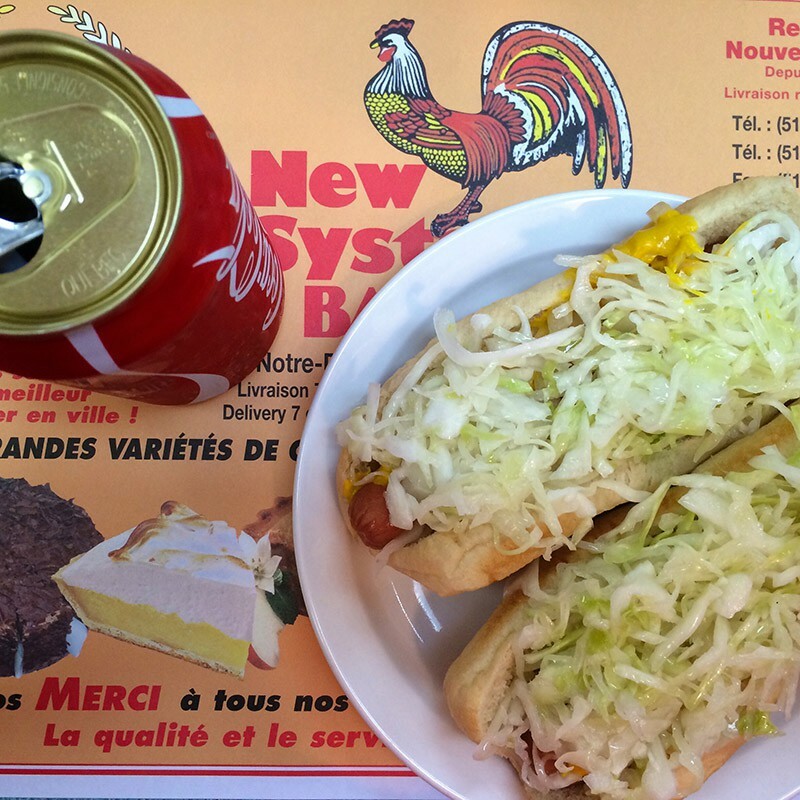 The Montreal Steamie – a Montreal classic that few outside of Montreal know about. 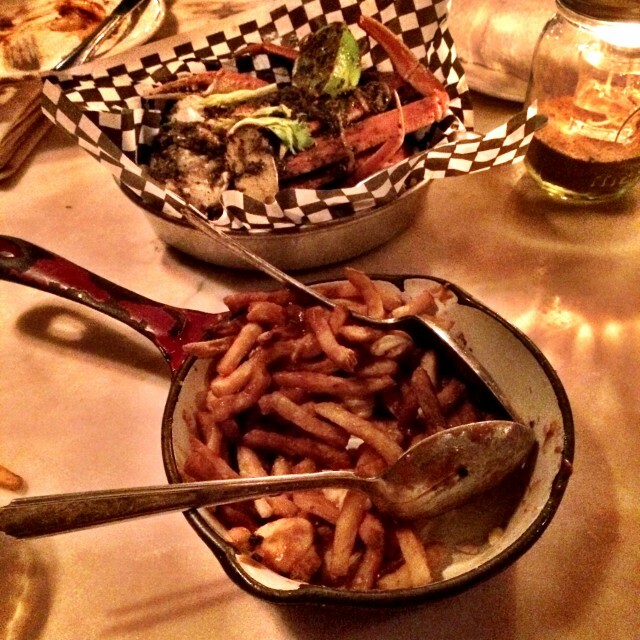 But it ranks right up there with poutine, bagels and smoked meat as iconic Montreal food. Over the last 15 months I’ve made five trips to Montreal – all in the name of planning a conference. The fact that eating took up a huge part of those trips was all good planning if you ask me! Prior to that, I had been to Montreal twice in my life – and had never spent much time in the company of locals – or even former locals. But it has become my favourite city in Canada to visit (although I withhold absolute judgement until I get to spend a little more time in the Maritimes). These last five trips have all been spent in the company of my good friend and business partner, Ethan. And what a difference that has made! Ethan, you see, lived in the city for 10 years while he went to grad school and then worked for the legendary Montreal Canadiens. Before that, he spent vacations there visiting his grandparents while growing up. He’s bilingual and has lived in virtually every neighbourhood in the city. So getting to travel with him, as well as getting to visit mutual food blogger friends in the city, has let me see a whole different side to Montreal – especially when it comes to food. Montreal is known for its smoked meat, its bagels, maple syrup, poutine, some of the most sumptuous patisseries you will find in Canada and, its outstanding public markets. There is a plethora of higher end restaurants known throughout Canada and even the world: Joe Beef, Au Pied de Cochon, Garde Manger, Touqué, Bouillon Bilk – just to name a few – who have that little extra bit of decadence that you don’t see in Vancouver or anywhere else in the country. On each trip we’ve made it a goal to try out one of the more well-known restaurants with stops at Garde Manger, Satay Brothers, Maison Publique, Gema Pizzeria and Restaurant Gus, all of which we enjoyed immensely. I also try to make sure we stop at at least one outstanding patisserie per trip, with the help of Jan from Kitchen Heals Soul (the girl knows her pastry!). 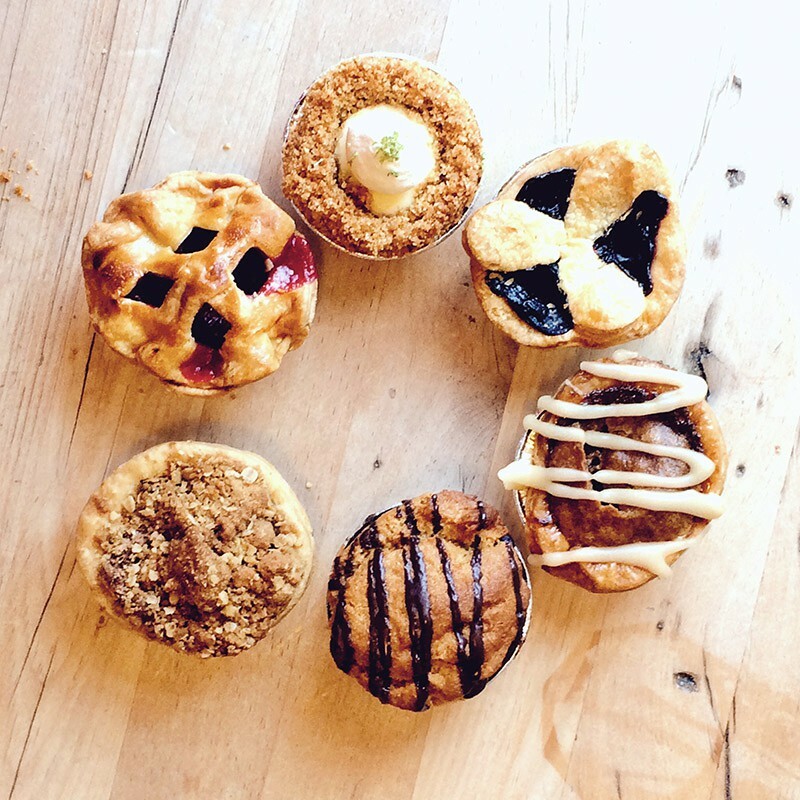 Mini pies at Rustic Pies in the St. Henri neighbourhood. 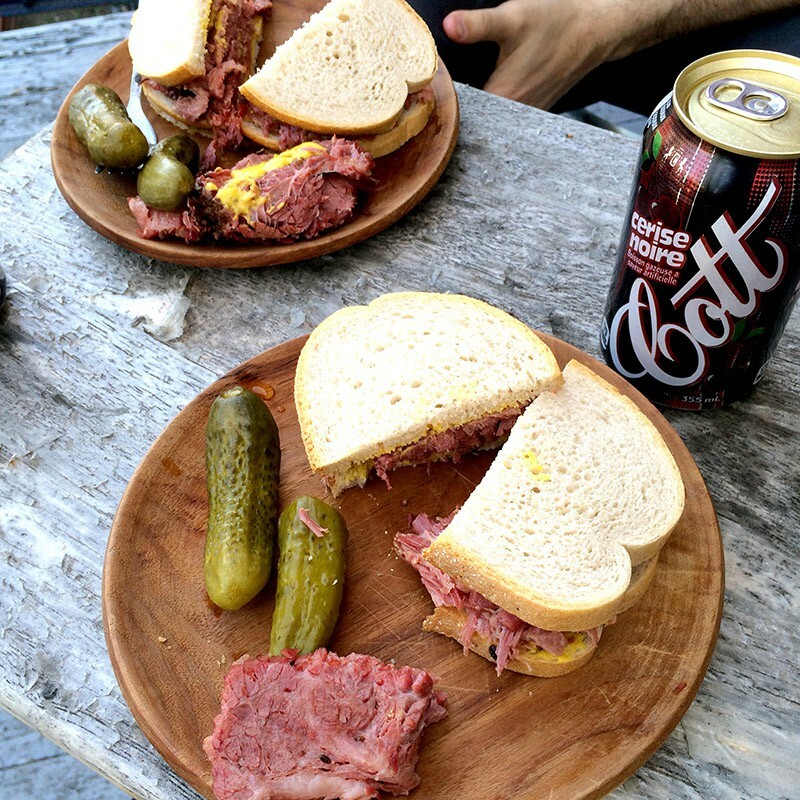 Preferably we try to avoid the lineup to eat in the deli and instead, get a packet of meat and a loaf of bread to go and eat it on the patio of our Air BnB – two cans of Cott’s Cherry Cola and Schwartz’s pickles are a must. If you don’t get the pickles and cola, it’s pointless. In fact, this is such a Montreal institution that we brought the entire Schwartz’s experience to FBC2015 last weekend – including a Schwartz’s carver! 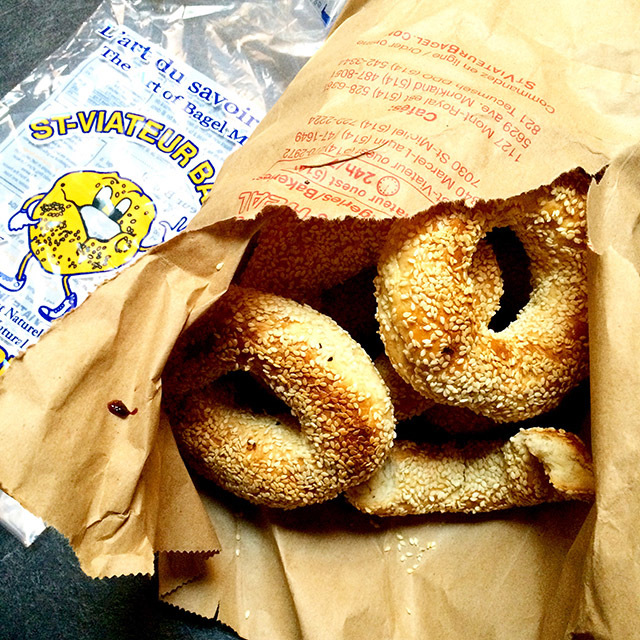 Our bagels always come from St. Viateur Bagels. There is a never-ending rivalry between St. Viateur and Fairmount Bagels in Montreal and loyalties run deep among the locals as to which is best. Being a west coaster, I can’t really tell the difference but Ethan is a die hard St. Viateur supporter so that is where we go. Get the sesame seed ones – eat a couple while they’re piping hot. 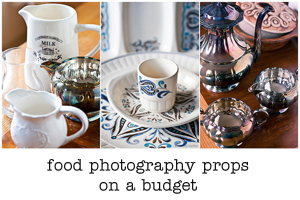 Get a few dozen extras to stuff in your suitcase and bring home. You won’t regret it. 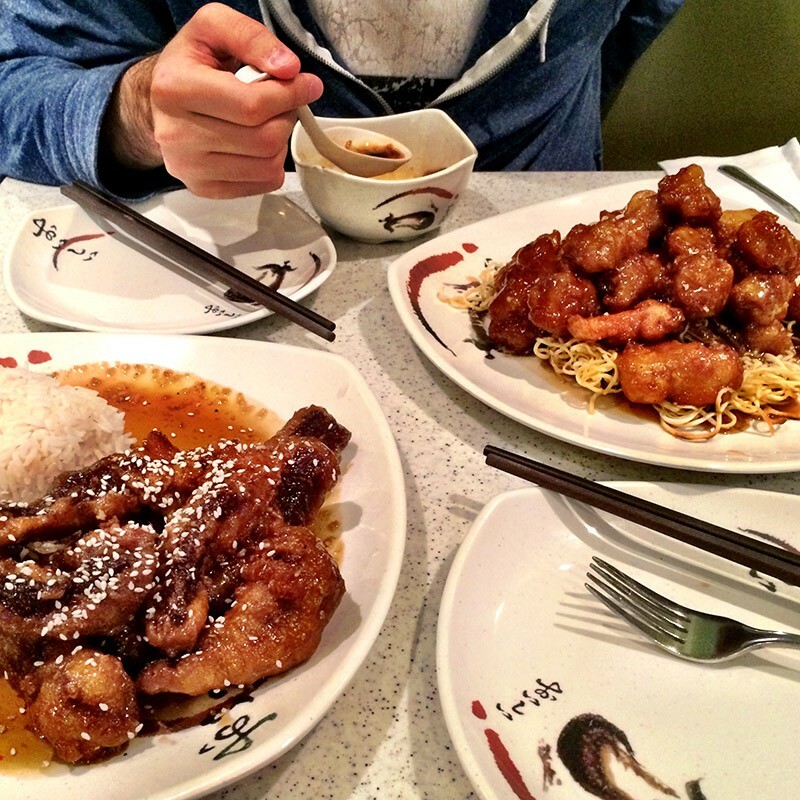 Every visit, we head out to Concordia university to a small Nouilles Express just off campus for the General Tao chicken of Ethan’s grad school days. It’s pure, sticky, deep fried deliciousness in the most hole in the wall of hole in the wall settings. Cash only. And it’s always full of university students. And they’re all eating General Tao chicken – with the occasional other side dish. I’m pretty sure they put something in it that makes you addicted because just writing about it right now has my stomach whimpering for a plate full. This is my guilty pleasure, not Ethan’s. 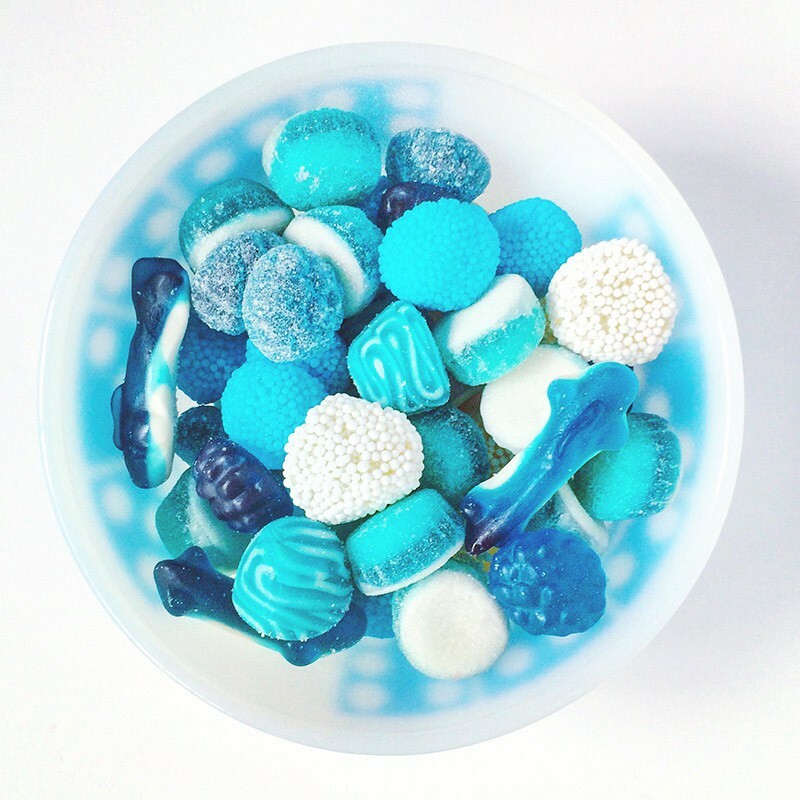 You can find this chain of candy stores in Calgary, the Maritimes and… Montreal. But not Vancouver. They sell bulk loose candy with every kind of gummy you can imagine. While Bulk Barn (which we finally have here on the west coast) rivals them in selection, there are still a few of my favourites that I can only find at Freak Lunchbox. Although.. on this last trip Jan gave me some samples of candy from Squish and it was pretty delicious! That will be on the list for my next trip! This is a phenomenon I didn’t know about until my first trip to Montreal with Ethan. I’ve never experienced this in any other part of Canada – and I’ve traveled the whole country from coast to coast. It doesn’t look like anything other than a very cheap hotdog. And when I say cheap, I mean it. Anywhere from $1.00 – $2.00 depending on where you go. What is it? The version I was introduced to was the all dressed steamie which means it comes with mustard and is topped with a cabbage and onion slaw. The buns and weiners are exactly what you experienced at birthday parties when you were 8 years old. The whole thing – bun and wiener – is steamed. It turns it into the softest, melt in your mouth hot dog you’ve ever had. In other words, it’s not something that hyper health food, farm to table, organic ingredient conscious Vancouverites would embrace. Ethan usually gets two and I usually get one. Ok. Sometimes I get two. No matter where we stay in Montreal, there is always a diner on the corner that serves steamies (you can also get toasties – a toasted version that doesn’t seem to be anywhere near as popular) as well as poutine or just straight up greasy diner fries amongst other diner staples. The diners all look like run down dives from the sixties and seventies – although some have been around a lot longer but the seventies was probably the last time they saw a facelift – and you must visit at least one on your trip, not just to experience the deliciousness of the steamie but also, to soak up the atmosphere. 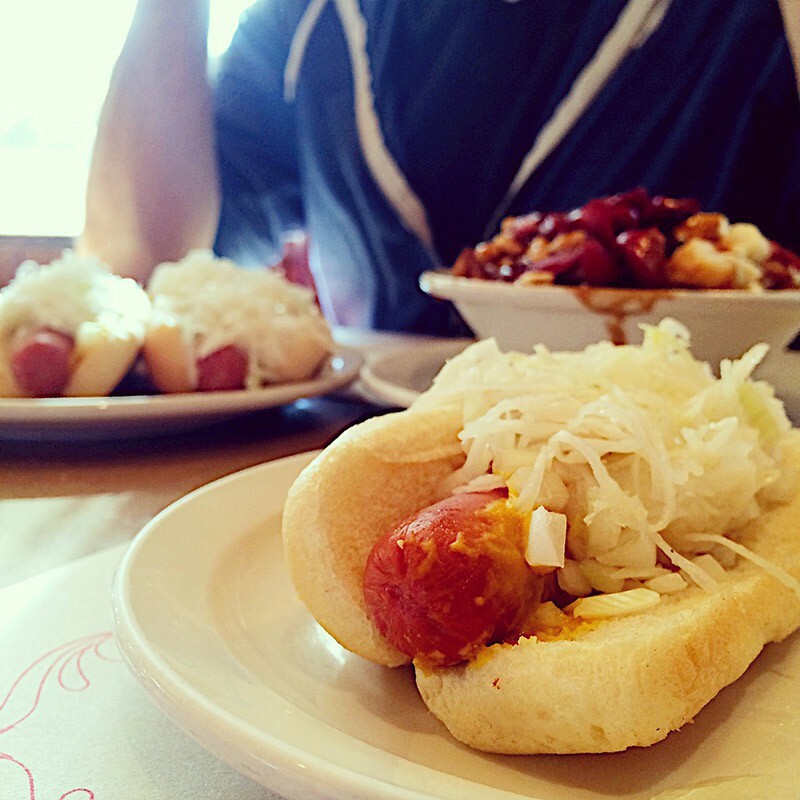 You will see a complete cross-section of Montreal life while you wolf down your hotdog! The classic steamie location is the Montreal Pool Room (and despite the name – there is no evidence of pool tables!). They’re credited with being the inventor of the steamie and have been serving them since 1912. The location is interesting and some might find it a bit sketchy but, if you’ve ever visited the down town east side of Vancouver while trying to get to Meat and Bread, then you won’t even blink! It makes for a fun experience. Plus, being located on St-Laurent, they’re just a few blocks away from Freak Lunchbox (also on St-Laurent). While you might expect the employees to be high school teenagers, they’re more than likely to be in their 50s and 60s and have probably been working there serving up steamies and poutine since they were kids. And the tables always have the cheesiest retro placemats. The whole steamie experience is just that – an experience. 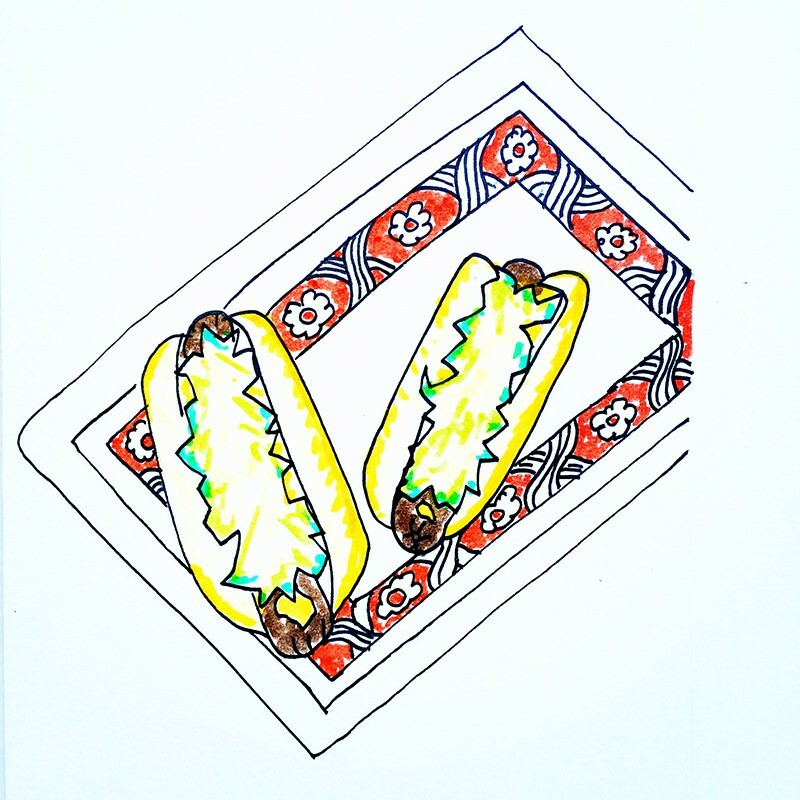 And one you must try, whether you like hotdogs or not. 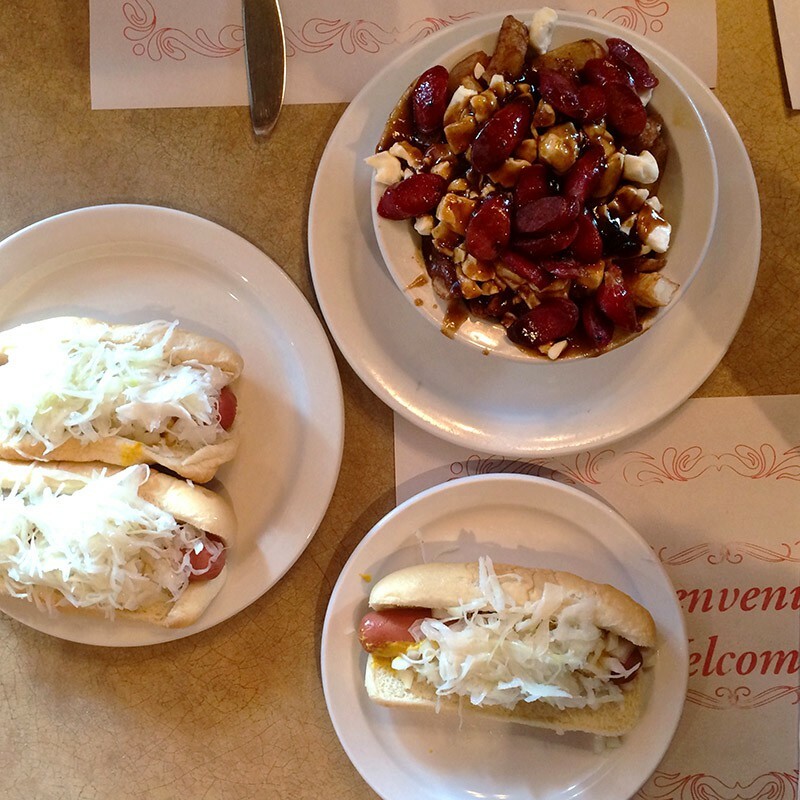 But if you’ve ever even remotely enjoyed a hotdog, I’m pretty sure you will love the Montreal steamie! 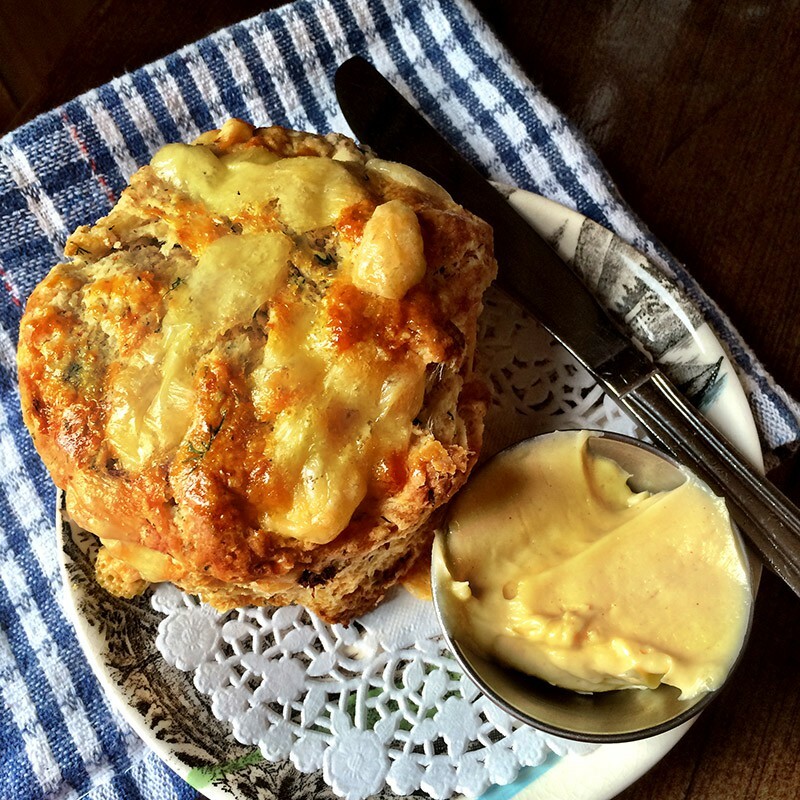 Next time I go to Montreal I am adding steamies to the list of must tries! I can even get a plain one for my kid and he’ll be happy. Loved this post Melissa. Well I won’t lie, wonderful to hear you say such nice things about y city lol. Grass is always green by the neighbor – I LOVED Vancouver. It was a pleasure meeting you even if ever so briefly. Love the post. Funny enough, as a local, I do not consider steamies a Montreal thing but it is not the first time I hear it. I guess I should give it another shot. I have seen them on the odd occasions (usually called something else) but they’re just not as good and the whole Montreal diner experience is very unique to Montreal! Ah, if you know when to go, and where to look, you can sometimes get a steamie for 75¢. Cash only though. 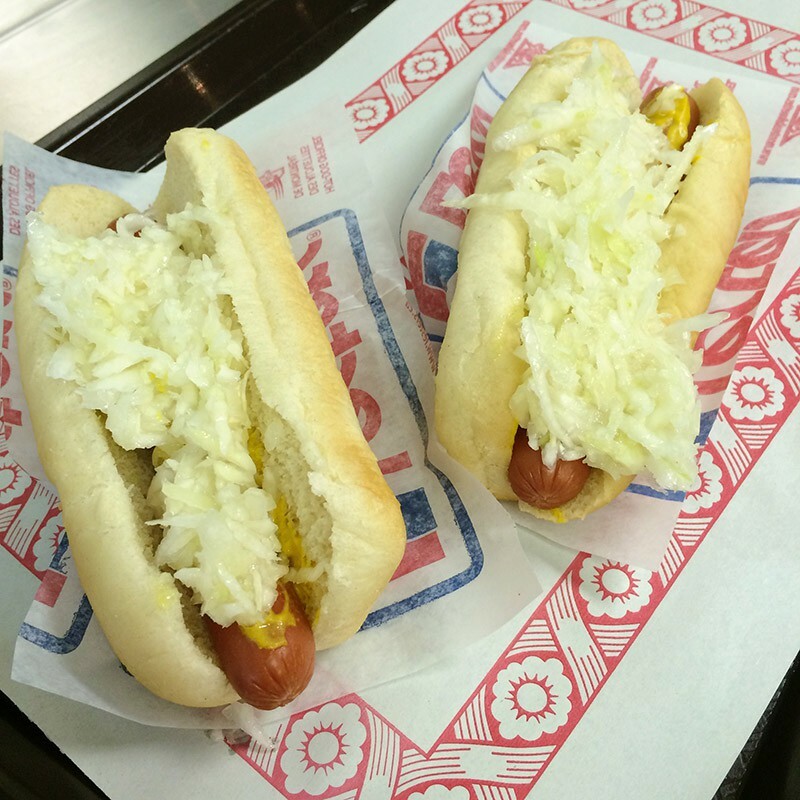 Order it “Hot Dog, All dressed…” in French or English, and you are good to go! Glad you got have a great time in Montreal. I’ll see you in TO for the next conference! How did we miss the steamies? and the mini pies in St Henri when we went for our culinary tour? *Sigh* Now, I need to go back just for the food. But I loved the Fairmont bagels! I ate their onion bagel whilst it was still warm, out of the bag and it was absolutely amazing. I still have a bag frozen in my freezer for those bagel emergencies. 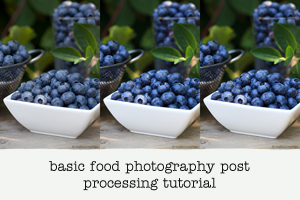 Loved your post and I’m saving this page, as I intend on driving back to Montreal on a foodie weekend soon. Thank you! 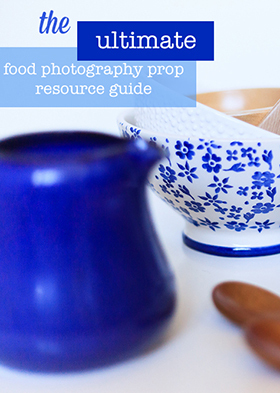 What a great guide to the foodie scene in Montreal! I’m so happy I was able to try a Schwartz’s sandwich while I was in Montreal. My husband found it organically when he went for a walk near our hotel – then texted me to tell me that he had just eaten the best sandwich of his life, and that I should do everything in my power to get one while we were there. Little did he know that I was about to eat the exact same thing at FBC (he was right – it was the best sandwich ever). I regret not trying a Montreal steamie now, and feel like I’m going to have to try re-creating it somehow just to get it out of my head, lol. Thanks for all the recommendations, Melissa! My old work used to have Montreal deli cafeteria downstairs which I really liked and now I can’t wait to try the authentic Montreal meat @ Schwartz’s Deli! You make steamies sound like a must try. I used to make many trips to Montreal in my childhood (from the Maritimes) and a lot of these places are familiar to me and I’ve visited many – back in my carnivoric times. 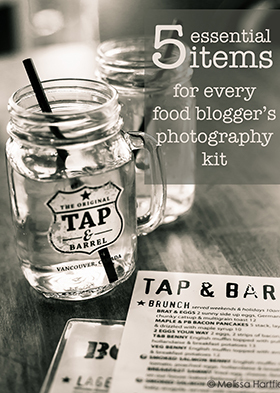 I love finding the best places to eat and drink from a local or past local.